Folgate Insurance is Coming in December! 16 NovFolgate Insurance is Coming in December! When will Folgate Insurance Company Ltd start writing business? What will happen to APC Underwriting and do I need a new TOBA? 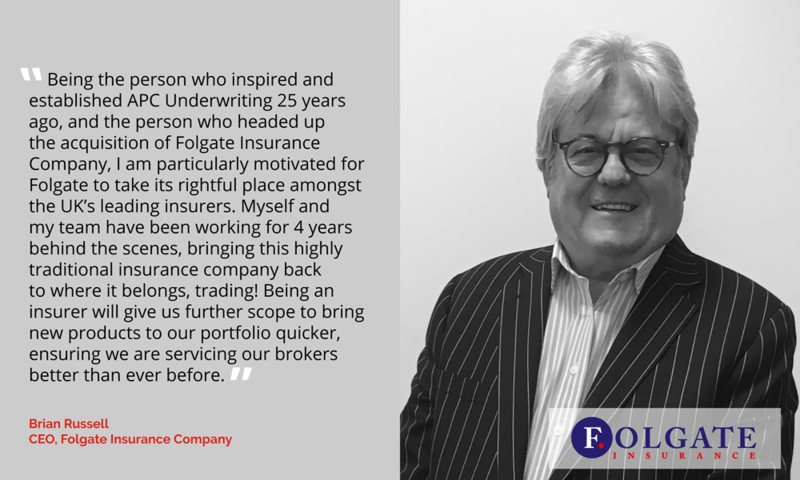 APC Underwriting will continue to Underwrite as Folgate’s managing agent, dealing with existing policies in line with current procedures. There will be no requirement for a new TOBA. Renewals will be offered as standard from December 2018. Any policies due to be renewed from Tuesday 1st January 2019 onwards, and any MTA’s for existing business, will also be underwritten in line with current procedures. How will I transact business with Folgate Insurance Company? Other than binding authorities and exclusive schemes, APC’s current on-line trading platform will be re-branded as Folgate from the launch in December. Your log in details will remain unchanged and it is business as usual on-line. There will be no changes made to any contact details or to members of the team.